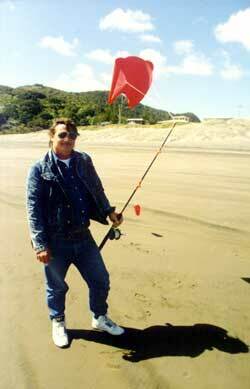 Pocket sled kites are a cross between parafoil kites and a parachute kite, they are a great beginners fishing kite. This kite is suitable for towing two to six hooks a long way out to sea and are suitable for line weights of 8 to 15kg breaking strain and in light to moderate winds. These are a ram air design like parafoil kites and gain rigidity from the wind filling the pockets and body. They have a tapered body and tapered pockets to increase stiffness. This is our largest sparless pocket kite. The large pocket sled is supplied with a flying bridle and a drogue kite tail. If this is the only pocket sled you will have, we recommend flying it on 10 to 15kg breaking strain line. A second drogue can be used to improve your strong wind performance. The large pocket sled is usually used in conjunction with the small pocket sled. If you already have a fishing rod and reel these large pocket kites will get you casting as far offshore as your reel capacity allows. Further distance and improved light wind performance are possible if you use 15kg superbraid as the mainline. If you need a fishing kite that will perform in a wider wind range and/or a much more tackable kite, check out our Flexiwing Delta Kite. Rod and reel, handspool, and kite line not included. See Pocket Sled Conversion Kits for complete ready to fish kits. 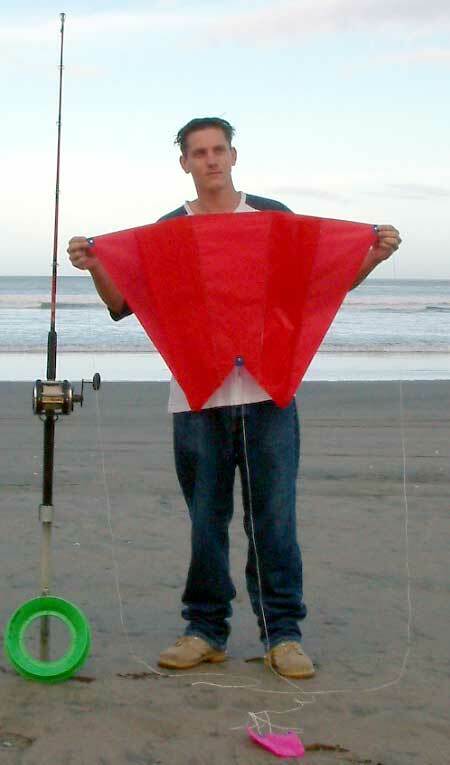 Use the Large Pocket Sled kite for casting fishing lines well out to sea in light to moderate offshore winds. Pocket kites are easier to launch than parachute kites or parafoil kites and will provide a fairly constant pull during flight. The Drogue is fitted to a tail rope which has a swivel and snap clip at the other end. The clip is secured through an eyelet at the back of the kite.